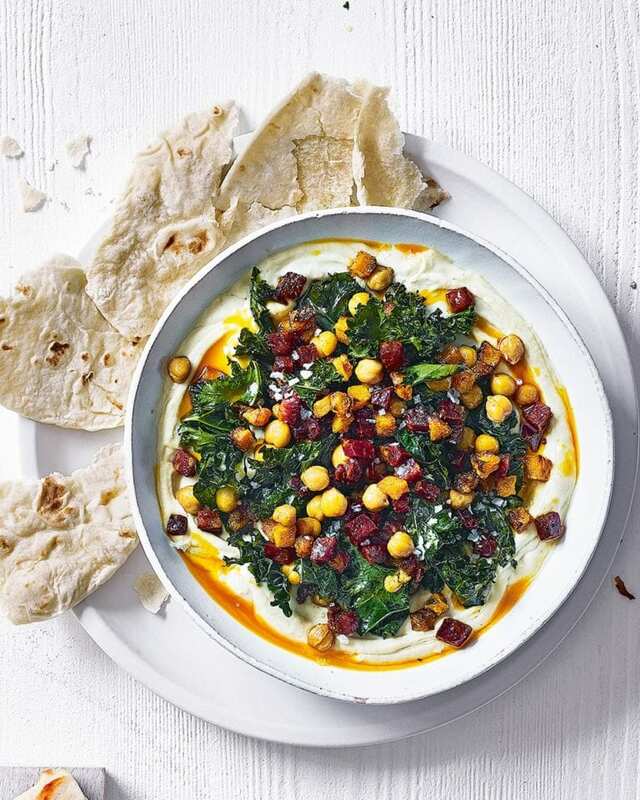 You could easily double the quantities for this houmous bowl with chorizo and crispy kale to feed a crowd. Serve with warm flatbreads for dipping. Heat the oven to 200°C/180°C fan/gas 6. Put the butternut squash in a roasting tin, toss with a drizzle of olive oil and season. Roast for 30 minutes until soft and starting to caramelise. Cook the chorizo in a pan over a low heat for 7-8 minutes until it releases its oil; transfer to a plate using a slotted spoon, reserving the oil. Once the squash is soft, add a the chickpeas to the roasting tin and toss. Sprinkle over the ground coriander, toss again, then roast for 15 minutes until the chickpeas are starting to crisp and the squash has caramelised. Put the kale on a second baking tray, add another drizzle of olive oil and roast for 10 minutes or until crisp. Spoon the houmous into a shallow bowl. Top with the kale, squash and chickpeas and chorizo, then drizzle over the reserved chorizo oil. Serve with warm flatbreads. We used Crosta & Mollica Piada flatbreads, available from Sainsbury’s and Ocado.